Liverpool have had to deal with further speculation that Philippe Coutinho is on his way to Barcelona over the past couple of days, but news from Italy regarding another Reds midfielder has emerged this morning. 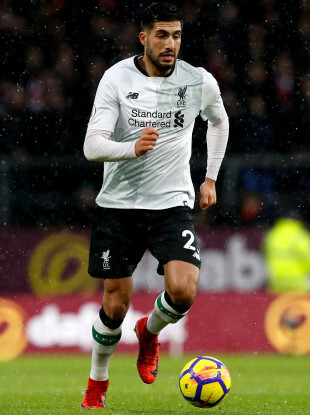 Sky Italy are reporting that Serie A champions Juventus have reached an agreement in principle for German international Emre Can, who can leave Anfield on a free in the summer as he has entered the final six months of his current deal. Celtic’s young defender Kieran Tierney looks destined for great things in the game, and the Scottish treble winners tied the 20-year-old down to a new six-year deal as recently as October. However, the Daily Record claim he is on Manchester United’s shortlist of left-back targets along with Brazilian Alex Sandro of Juventus. The same newspaper adds that Fulham’s teenage prodigy Ryan Sessegnon is also wanted by United, Paris Saint-Germain and Tottenham. Everton are in the market for a striker and Turkish international Cenk Tosun appears to be close to joining the Merseyside club. In fact, the Toffees just need to agree personal terms with the Besiktas centre forward, 26, and Sam Allardyce says a mooted £27m deal could even be wrapped up before tonight’s FA Cup tie with city rivals Liverpool. Tosun has 14 goals in all competitions this season, including four in the Champions League. Newcastle also wanted Tosun, but Rafa Benitez could now turn his attention to Watford’s Troy Deeney. West Ham manager David Moyes has admitted he is shocked by rumours that Hammers striker Andy Carroll could make a January switch to Chelsea, and he’s not the only one. The champions, who are on the verge of bringing in Ross Barkley from Everton for £15m, have been linked with the former Newcastle and Liverpool target man. 12 years ago today, Manchester United paid around £7m to Spartak Moscow for a Serbian defender by the name of Nemanja Vidic. After a shaky start to life at Old Trafford, he would go on to become one of the club’s finest-ever players as part of a rock solid central defensive partnership alongside Rio Ferdinand. Vidic won five Premier League titles and the 2008 Champions League under Alex Ferguson. He departed for Inter Milan in 2014 and retired two years later. Email “Juve reach agreement for Liverpool midfielder and all today's transfer gossip”. Feedback on “Juve reach agreement for Liverpool midfielder and all today's transfer gossip”.